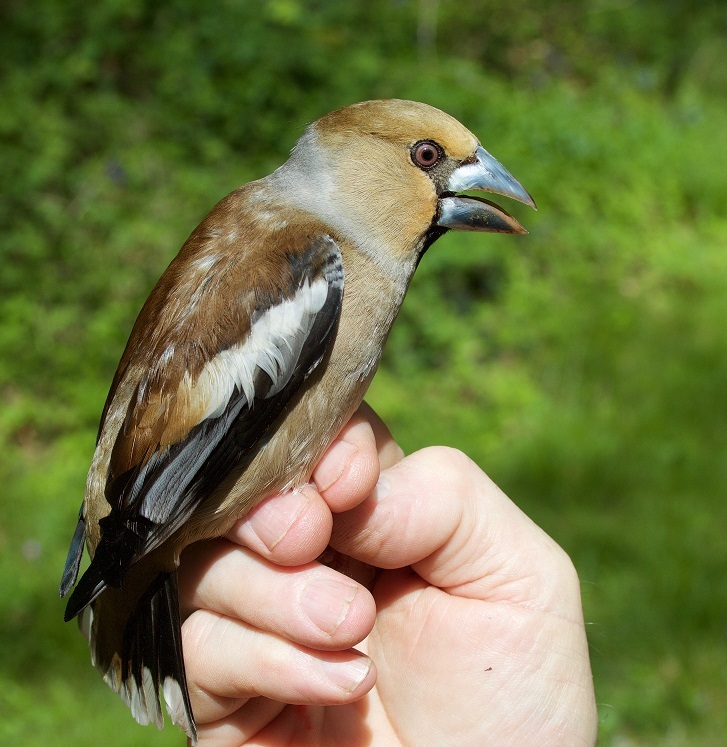 With the influx of Hawfinch into southern Britain this winter, Jerry Lewis started one of his feeding sites much earlier than usual (in mid January) hoping to try and catch some of the visitors. Despite a decent sized flock of 40+ birds visiting the feeding site, they were mainly coming down to Hornbeam seed, rather than sunflower seeds. After two months, catching had been very slow (just 16 birds caught, at a rate of one every three hours), but after mid March it started to pick up. The largest catches began from mid-April onwards (as happens most years), averaging a 'finger numbing' two birds per hour. Despite problems at two of the feeding sites - sunflower seeds being taken by squirrels/wild boar (leaving few for the birds) and a road closure preventing access to a third site, it was Jerry's most successful year to date. By the time his 'catching season' was over he had caught 202 birds, which included 43 that had been ringed in previous years (plus a small number of same-season recaptures). It is unlikely that many (any) would have been continental birds, as migrants had generally left by early April in previous years. Five of his recaptures had originally been ringed in 2010, making them comparable with his current British & Irish longevity record of 8 years 1 month 22 days. One female, caught on 5 May 2018, topped these however, having been ringed on 1 May 2008, 10 years and 4 days earlier; a big increase in longevity. This bird was ringed in the northeast of the Forest of Dean - nr Cinderford, was caught twice in April 2010 - near Tintern in the Wye Valley (20 km SSW), before now moving to near Chepstow (7 km further SSW). 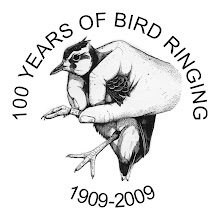 What seems to be surprising is how rarely the 2010-ringed birds had been re-caught (three had been caught once since ringing, the other two hadn't been re-caught at all). Jerry's next challenge is to try and understand why these long-lived birds are not re-caught more often.